Acid Surge is a Pyromancy in Dark Souls 3. To cast a Pyromancy you must use a Flame or Special Weapons that can cast Pyromancies. Pyromancy of Carthus of the Sands. 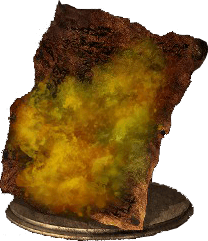 Emits an acid which corrodes weapons and armor. Carthus' swordsmen attached great value to victory, and would not shun the use of such pyromancies. For where is the honor in death and scoured bones? Destroys the durability of Weapons and Armor of the enemy. The enemy has to be in the mist. As of Version 1.08, Acid Surge will deal approximately 110 Durability damage if the opponent stays within the cloud for the entireity. When cast at point blank, it will deal approximately 20 Durability Damage. Can be used around corners and through objects. Often used as a "smoke screen" in pvp, to confuse your opponents, since its primary use is kind of limited. Not reccommended for Arena-based PvP, but might proove useful in group fights as to scamble or worry opponents. I think this spell would be much better if it was able to hurled like a ball of acid and explodes into a puddle at the end. Like an instant 50 durability damage upon direct impact and 5 durability a second for the puddle. Just about the only use I can find for this is messing with Frayed Blade and Repeating Crossbow users. I decided to test this against some Lothric Lads to see if it has any use in PvE. I hit a Lothric Knight for 312 damage, then used Hidden Body to allow me to cast Acid Surge on him 12 times, each for its full duration, while he stood there like a lemon. I then hit him again for 312 damage. I went down the stairs to the shield/spear hollows and repeated the test. I hit one for 174 damage to the shield and 387 to the body. I Acid Surged him as before, then hit his on the shield and body for 174 and 387 damage respectively. This implies that enemies may not actually use equipment, their weapons and armour may just be visual; defenses and resistances may be innate properties of each enemy. Just so that this spell has any use, it would be neat if it dealt high damage to Dragonslayer Armor. You know, since it is equipment? When this spell was disintegrating durability like it was nobody&apos;s biz it kinda gave an actual purpose for the Repair Equipment option for Andre. Anyone knows if it works on yourself? I was under the impression that the spell slightly increased physical damage against enemies in PvE, is that not the case? Would this spell make enemy armor in PvE weaker? Kind of like the frostbite status. had this used on my by an invader for the first time yesterday. instantly broke everything I was carrying; straight swords, shield, bow, talisman... all instantly broken. repair powder didn&apos;t work. Thanks From. Instead of buffing durability enhancing equipment, like the wood grain ring, you would rather nerf a spell that honestly needed a buff. Sure it was powerful, but it made the spell viable and required players facing it to rethink their strategy. It also provided casters a sufficient smoke screen to create distance between them and pressuring melee builds. Sadly, the Acid Surge is useless once again. A single repair powder will render the fp investment to damage a weapon/shield mute. I think this is a prime example of a player community having too much of an effect on what dictates the meta. "Oh no, something is breaking my meta sellswords and carthus curved sword. From please nerf!" or "Oh no, my gank squads&apos; weapons are breaking. God how can we gank with broken weapons? From please nerf." Seriously, why didn&apos;t from simply buff useless items instead of gimping a spell that needed a buff? Shame. So. Know how the 1.08 patch Acid Surge way more effective than it was supposed to be by accident, and Fromsoft announced they&apos;d be correcting that? The 1.21 regulation change makes Acid Surge even weaker than it was before the 1.07 patch. Apparently, it wasn&apos;t supposed to be that powerful. Can&apos;t wait to bust out the Mean Bean Machine and tear down the cancer that is melee weapons. Not only can I slaughter the helpless infidels where they stand, but Andre is tossing me a 30% kickback on a now lucrative repair business. Patch 1.08 and From Software - bless you. The effect now does 300 durability damage over 5 seconds. Try not to stand in it. Beware Weebs! With the latest patch as of the 21st, your weeb sticks will crumble beneath this spell. Seriously though, it happened for the first time last night. I actually had to go to Andre to fix a broken weapon. It was so fast there was very little I could do (valid it was a gank squad and one was spamming the spell). This spell has a niche now, and I love it. Currently completely worthless. People have tested, and to break average armour-sets it takes over 20 separate casts. Breaking weaker weapons like Katanas would be faster, but this is still completely horrible. This spell will be buffed in the 21st October patch, time will tell how substantial the buff is.